The phrase boxing for the Olympic dream comes alive in the fists of five of our Canadian National Team members as they will head to Baku, Azerbaijan, to compete at the AIBA World Olympic Qualification Event on June 14-26. The last qualifying event for male boxers at the AIBA Open Boxing program (AOB) will offer the last 39 spots for the 10 Olympic weight divisions: five in 52, 56, 60, 64, 69, 75, amd 81 Kg; and one in 91 Kg. 42 Kg has 2 available spots. The selected boxers are Thomas Blumenfeld (52kg), David Gauthier (60kg), Mohammed El Abdouli (69kg), Clovis Drolet (75kg), and Samir El-Mais (81kg). Samir El-Mais will be competing in the 81kg weight division instead of 91kg as Boxing Canada is confident he has better chances to qualify in this weight category. The 2014 Commonwealth Games Gold medalist has been training according to the demand of the weight change, as this will be the first time in a few years that the boxer will be competing at 81kg. His effort, in hopes of earning one of the five spots available in the Light Heavyweight division. Mohammed El Abdouli has earned the opportunity to represent his country after great performances at the National Championships last month where he grabbed the gold medal. Although Sasan Haghighat-Joo had qualified at the Olympic trial in order to represent Canada in this weight division, he is currently unfit to box due to an injury that occurred during the 2016 Ken Goff Memorial. Following impressive performances at the Continental Qualifier that earned him a bronze medal, David Gauthier has fully recovered from his shoulder injury incurred during the semifinals of this event. He is now 100% and ready to compete. Thomas Blumenfeld, the youngest member of Team Canada, and Clovis Drolet will respectively be representing Canada in the 52 Kg and 75 Kg categories. Blumenfeld has shown immense growth in his boxing skills and abilities during the Ken Goff Memorial and the Brandt Cup against Germany. “The selection has been based on a multitude of factors to ensure that the best boxers are representing Canada at the World Qualification Event. There are five spots available in all weight categories where we have a selection and all these boxers have the experience and maturity we are looking for.” said Daniel Trépanier, Boxing Canada’s High Performance Director. The team will depart for Baku accompanied by coaches Daniel Trépanier, Gordon Apollini and Kevin Howard. As of right now, 64 Kg Arthur Biyarslanov is the only qualified male boxer. He confirmed his ticket during the American Qualifiers in Argentina in March, where he was also the gold medalist. On the women’s side, Mandy Bujold (51 Kg) and Ariane Fortin (75 Kg) are the two female boxers who have punched their tickets to Rio. 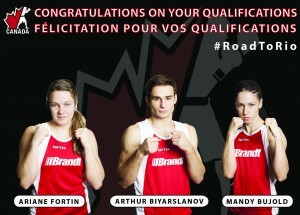 Rio 2016 is less than 75 days away and Boxing Canada is putting all its efforts to help their boxers reach their lifetime dream as well as increase their team from three in London 2012 to six for Rio 2016. “The Olympic Games are only every four years and our goal is to continue to increase the number of boxers we qualify and more importantly, to win medals.” Said Pat Fiacco, Boxing Canada President.